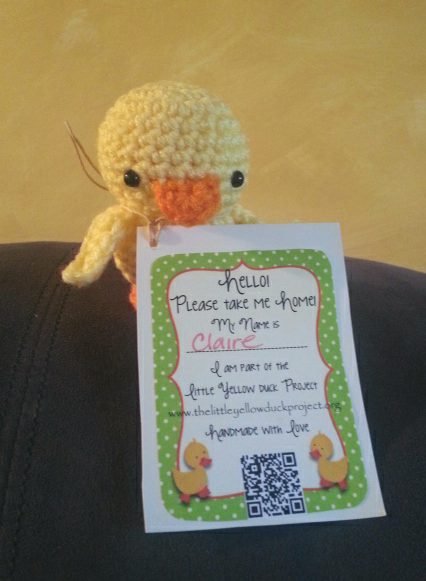 For the past 2 weeks I’ve been more than a little obsessed with The Little Yellow Duck Project. 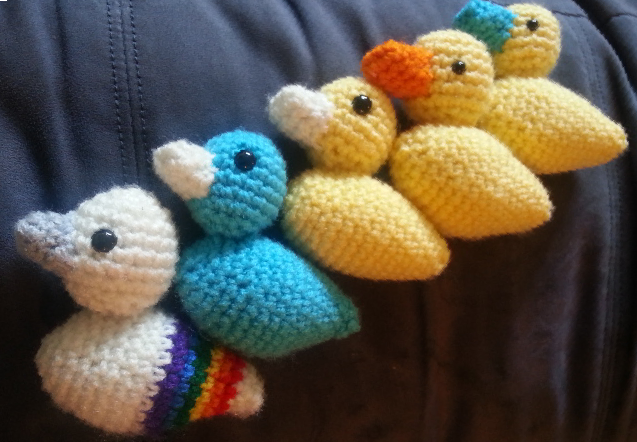 I’ve been crocheting little ducks like crazy and my son, husband, and I have now placed 34 ducks in NYC, Long Island, and around Westchester County. It’s ridiculously fun. Sneaking around. Trying to leave a duck in a super crowded place without being noticed. Eagerly checking The Little Yellow Duck Project’s world map to see if any new ducks have been reported. The rush when we’ve had another duck on the map. The amazement that our ducks were the first ones reported in NY state. The shouts of joy when we realized that the 500th duck reported was one we had left! My husband’s continued attempts have resulted in 0 of 14 ducks on the map. However, after leaving ducks on his coworker’s desks and discussing the project with them, he learned that one of them is about to donate a kidney in a few days. He didn’t feel it was right to push her to register it. She was doing more than her share for the cause. So what is the cause? The Little Yellow Duck Project has two goals: to brighten up someone’s day by finding a little duck and to increase awareness and registration for organ, blood, and bone marrow donation. How is that personal? My friend Tania who I mentioned in my last post died earlier this year at the age of 41 while waiting for a heart transplant. So what’s the deal with these ducks? 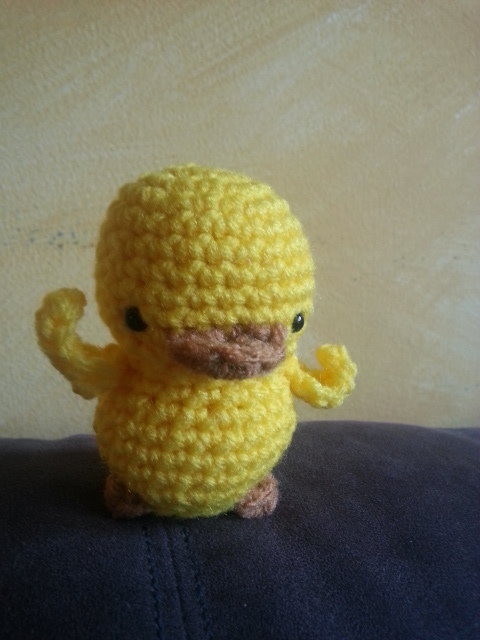 There are a few official free patterns, but you can make any duck you like however you want to make it and stick a tag on it letting people know to take it home and that it’s part of The Little Yellow Duck Project with the website listed. 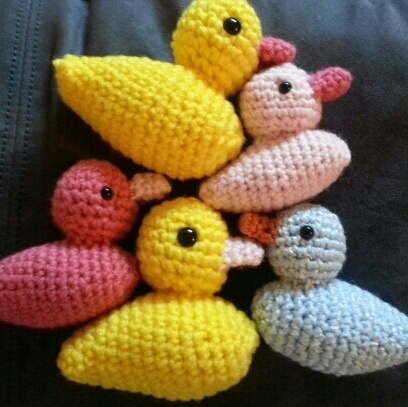 I’ve used both the Just Ducky Lovey pattern and Filbert. Both are free patterns and work up in about an hour. I’ve found that Just Ducky Lovey is better for sticking in places, like slots of a bench if it’s windy. Filbert stands up and works great for flat places like picnic tables or the top of washing machines. The tags are available in multiple languages on the website and even include a place for you to name each duck. 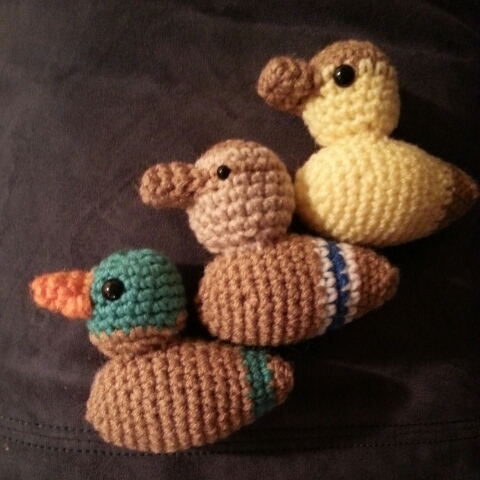 While I’ve crocheted my ducks, there are also patterns for knitted and sewn ducks. People have also made ducks out of pom poms and have made bags with appliqued ducks on them. This is an international initiative so no matter where you are, no matter what your medium, give it a shot. You just might make it on the map (and help to save a life in the process). It wasn’t until I started working on it that I realized I remembered this jacket from high school. I distinctly remember Damien and Jamar wearing this jacket in the high school courtyard. It’s the De La Soul jacket from the Three Feet High and Rising days… but I don’t really want to wear the De La Soul jacket, so I’m making a few changes. 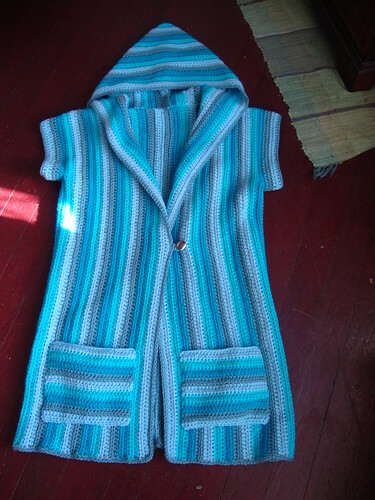 I’m making the hooded jacket along with a bunch of other people as part of the Hooded Jacket Crochet-a-long on Ravelry. I’ve been having a great time with it and the crochetalong part has really pushed me to think through the project and come up with some great ideas for modification possibilities. I’ve loved seeing what others are coming with on this one. Some have been super cute. The “vintage” pattern is available for free through the Jolly Plum blog. 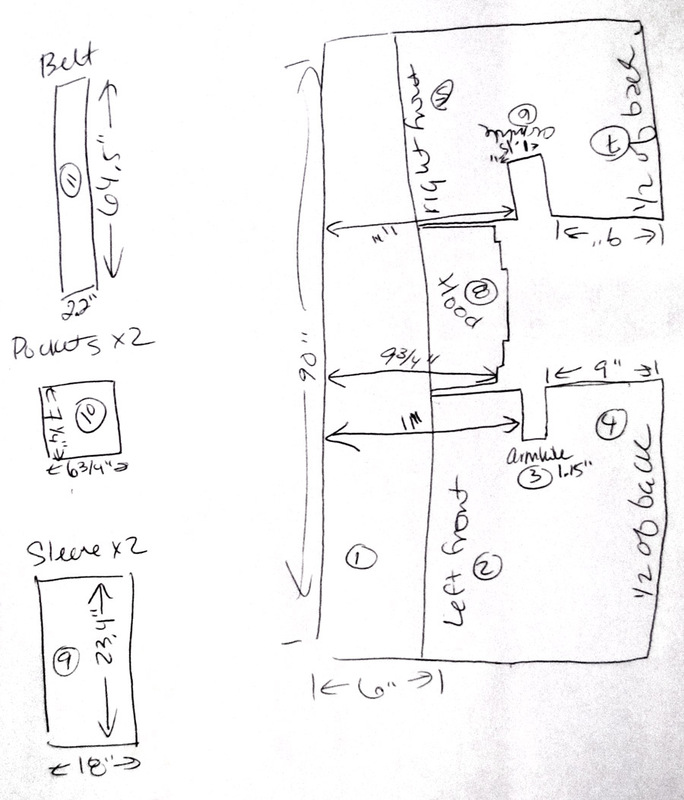 The first thing I realized was that the schematic was nowhere and I really needed it so I drew it up for size 14. Having the schematic helped me out more than I thought it would as I started planning my stripes. I decided to only go with 3 colors after putting together tons of gorgeous bright color combos only to later remember I would be wearing this in public and the days of Cross Colors had come and gone. While some do have the Amazing Technicolor Dreamcoat as their end goal, I do not. After making my Snow Day Bag, I loved the colors and yarn so much I decided to use the same ones for this project too… and it was on sale at Michaels again. Planning out the stripes was a lot harder than I realized. I wanted wider stripes in the center and thinner ones on the sides to give the illusion of skinny. In retrospect the skinny stripes in the pattern would have been fine for the entire pattern if that was the main goal, but I do like how the graduated stripe width looks. I was right around gauge with my H hook, so after drawing out the schematic I broke it into rows based on 2.75 rows per inch. After figuring out that I wanted stripes to go from 6 rows down to 2 rows at the sides, the first stripe issue I came across was matching the shoulders. It wasn’t too hard, but it did change my original plan. 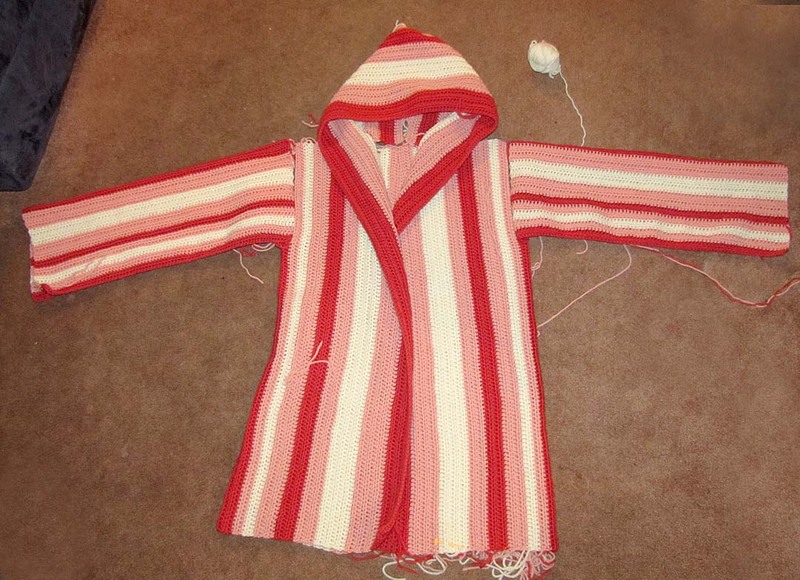 After the hood was done, I realized I hadn’t matched stripes from the hood to my neckline. This I’m letting go for now. The stripe police will not come after me… I pretty sure of it. The sleeves were redone three times before I was happy with the color pattern and stripe widths on them. I ended up realizing it would look best with the center sleeve stripe matching the center side stripe. Hopefully I’ll finish this weekend. Part of the CAL is that it does feel like a race. After seeing the challenges some others faced… yarn shortages, body shape needs… it really got me thinking about what modifications could be done with this pattern to create a great modified garment. It makes a great vest. If you have broad shoulders, just leave off the sleeves. If like me, you have more sloped shoulders, the shoulders would need to be 6-8 rows shorter, but you would still need that width in the chest, so maybe a graduated decrease instead of the squared drop to the armhole that the pattern has. I also think the armhole would need to be a little deeper for a vest. Being that the pattern is written for two strands of yarn held together throughout, I think this would make a great candidate for painted crochet to create your own ombre effect, similar to the Snow Day Bag. The one I’m making definitely fits me more like a cardigan than a jacket. I’m thinking of doing another to hit mid hip instead of mid thigh. At gauge, knocking off 77 stitches from the starting chain should be about right. This could easily be elongated for the full technicolor dreamcoat look, just know the starting chain will probably hit mid thigh and add on another foot or two to each side, 77-114 more stitches additional to the starting chain. Someone ran out of yarn and did a cap sleeve with a one button closure instead of a belt and turned the pockets so the stripes were horizontal. It came out super cute. It’s very easy to figure out where the side center is, it’s between the 4 rows of armhole shaping. A side slit is a simple way to accommodative larger hips. For the third row of the armhole shaping, along the bottom, make about 30 stitches not connected to row 2 of armhole shaping. This is definitely my favorite CAL at the moment and has helped to keep me focused on actually finishing this project instead of abandoning it for the next shiny thing to come along. If you want to take a shot at it, come on over and join the fun. We’d love to see what you do with it. P.S. I was completely unsuccessful when searching for a picture of anyone in De La Soul wearing this jacket so it is possible I am completely imagining it… but I swear I’m not.